Intelligentia delivers innovation to our Customers through innovative applications. Focused on our R&D activities and prototypes, our products are based on common core and on the most stable and cutting-edge technologies available in the Market. The application contexts may vary from general purpose Information Systems to very specialized tools for specific customer needs. Our portfolio is composed by web-based tools oriented to different Market segments: Aerospace, Finance, Industrial. All the applications we deliver have a common technological core based on our platform ELISA offering the possibility to deliver very stable and long term supported applications. Our Vision is to enable customer applications to be easy migrated to the Cloud, but to be hosted also on-premise. We are focused in delivering advanced web-applications based on consolidated technologies such as Java Enterprise Edition for the back-end, HTML5 based front-ends, always integrated with REST/SOAP service layers to enable third Party integration. 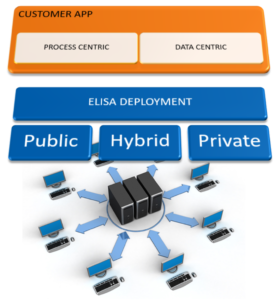 The use of ELISA’s modular architecture in our solutions offers the possibility to plug-and-play new modules in few clicks, extending the basic behaviour to fit completely the customer needs. In an even more interconnected world, in our vision is important to easily enable system interoperability and integration in order to create automated environment, foundamental for an Industry 4.0 implementation. Our products are responding in particular to the need of system integrations creating new value collecting data from legacy systems and converging new information in interactive dashboards, portable apps, always on services. You will find several ideas developed and distributed to our customers. All of our products are quality driven and fully customizable for specific needs.